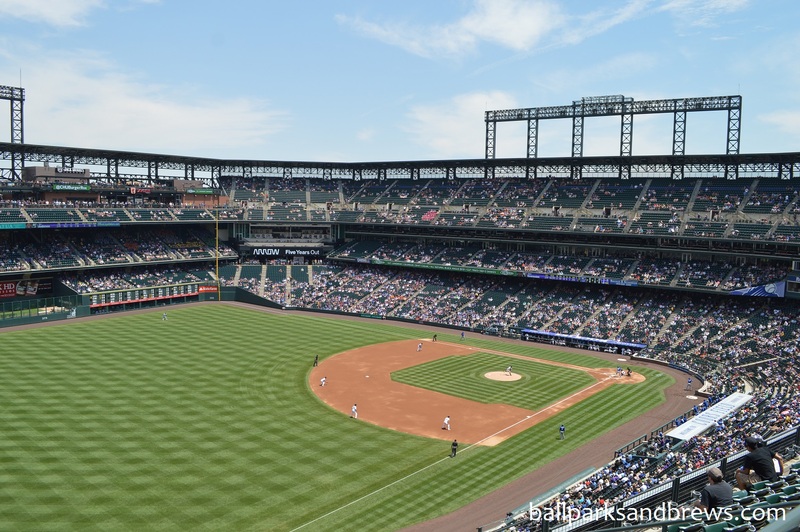 Ballpark Basics: A ballpark in the heart of beer country sorely lacking local options. Colorado is a well-known beer state and in the top five for breweries per capita. 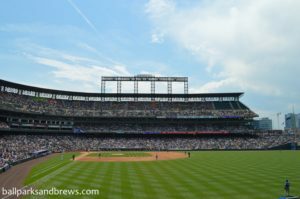 We were extremely excited to take in a game at Coors Field and enjoy some local beverages as we enjoyed the game. Unfortunately Coors Field did not live up to the hype. Not that we didn’t enjoy the ballpark. Coors Field is a gorgeous ballpark in a wonderful downtown setting. For a ballpark that opened in 1995 it has aged extremely well. Easily the most unique aspect of the park is the mile-high seats. The 20th row of the upper deck is lined with purple seats (instead of green like the rest of the ballpark) to signify that you are exactly one mile above sea level. Seats along the first base side have a great view of the Rocky Mountains in the background. 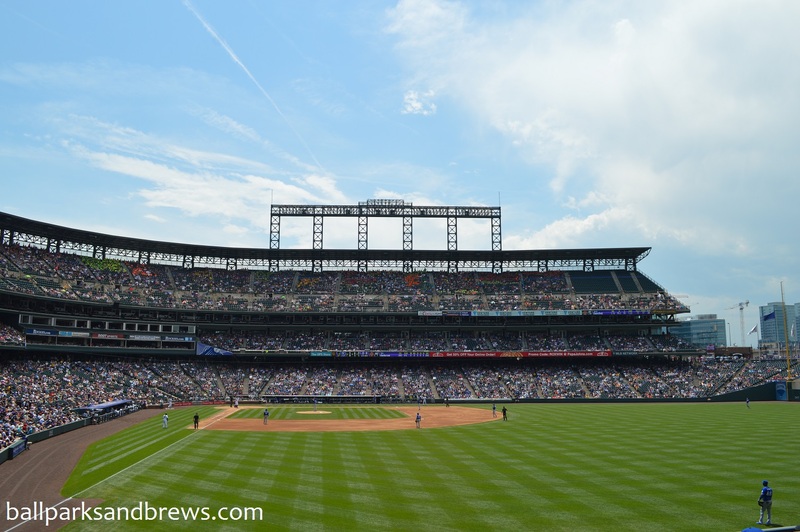 Best Spot for Beer: The Sandlot Brewery has been a part of Coors Field since in inception and according to the team, it is the first brewery inside a MLB ballpark. This is the brewery where Blue Moon was created and is a popular destination on game day. However, you best option will be to head up a few levels and head to The Rooftop Bar that overlooks right field. This has the most taps and most options of any other area in the ballpark (although the choices are underwhelming). You can find some local and craft beer at The Rooftop Bar but it is mostly from the larger breweries in the area (New Belgium, Oskar Blues, Great Divide, etc.) Not that we don’t enjoy these breweries it’s just that we were hoping for more from a state (and city) known for its beer. 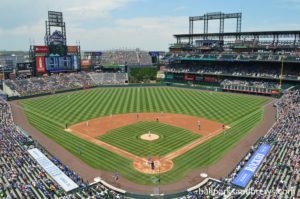 Coors Field has many things going for it; it is a picturesque ballpark with some of the best views in the majors. 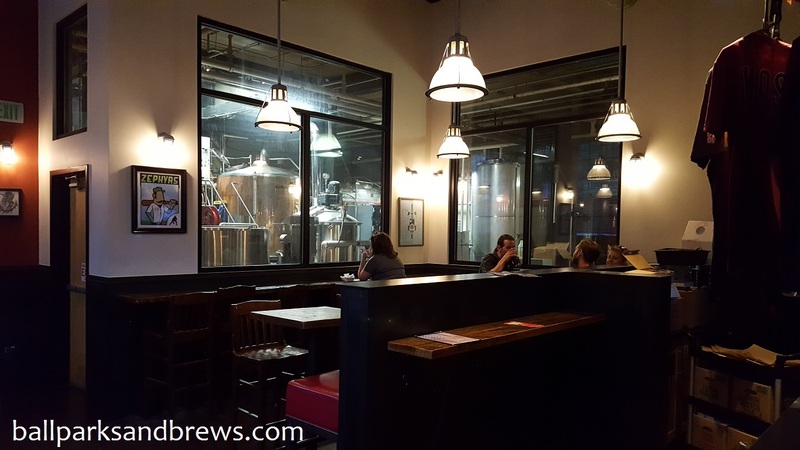 It sits in the middle of downtown and is surrounded by breweries, bars and restaurants (and even a ballpark museum). 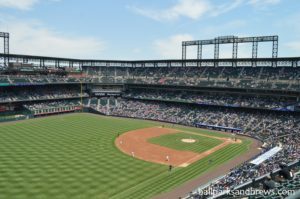 However, you will need to venture outside the ballpark to partake in a many of the craft and local options available in the Centennial State. Beer Basics: One of the original craft breweries still stands out in a packed field. 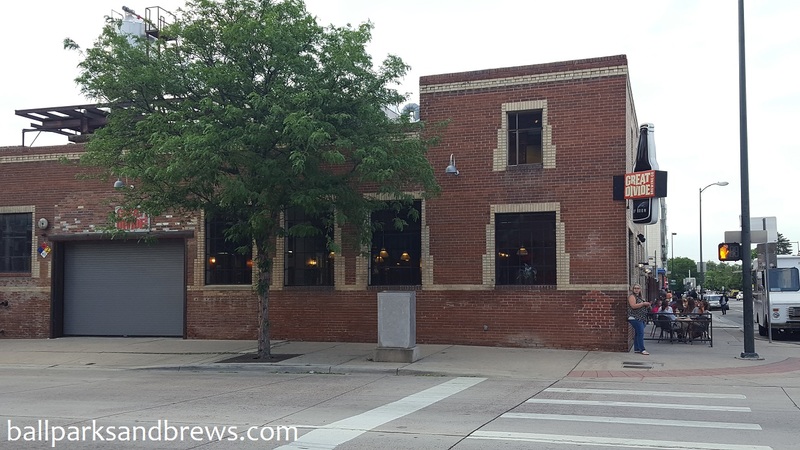 So while it’s true we tend to try to highlight the smaller, local breweries on our site, we are also not in the business of shunning a great one just because it happened to get popular. 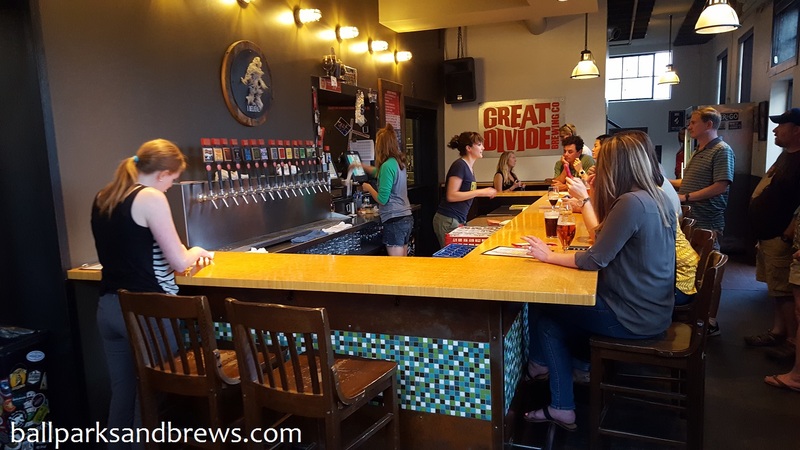 Great Divide in Denver is one of those whose beers reach far and wide, and many, including several varieties of their ever-popular Yeti are always in high demand. 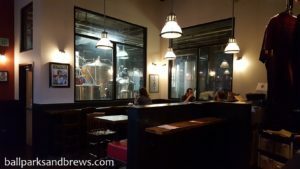 Yet the tap room itself manages to maintain a small, local bar feel, and is a must-go for us any time we happen to be in the neighborhood. Always a popular spot, you’ll find it’s tough to get a seat even in the middle of the week. They’ve got an L shaped bar, ledges and some tables along the wall, a second room with more seating (and popcorn!) and a glass wall that gives you a view of the brew tanks. For those who prefer, they have a full patio. Stay inside and you might get swept into an 80s sing along, with the bartenders who are clearly enjoying their jobs, and who work so easily in close quarters, you might wonder if it’s all choreographed. You’ve probably seen some of their stuff around, the most well known being the aforementioned Yeti (imperial stout), Titan (IPA) and Colette (Farmhouse Ale). Given the odds that you can get these for yourselves, we ventured beyond the standards and tried some of the rarer limited release options. Nadia Kali Hibiscus Saison (6.3% ABV) Apricot tones and an orangey brown ring of lacing. This wheaty saison has a floral nose for a bouquet that also smells just a hint sour. Tastes a bit tart, but the flower blossom comes out and prevents it from being tangy or bitter. Fruity, floral finish. Mild High Coffee Ale (6.5% ABV) A beer with reddish notes and a clearly white head across the top. Strong coffee and caramel aroma, but the taste was a bit flat with just a thin coffee palate that hints at malts but peters out before becoming anything really special. Light and thin. Ida May Nut Brown Nitro (6.5% ABV) Ruby colored with thicker off-white lacing. The nose was faint; dry and thin, almost woody. The absence of carbonation gave this a thicker, creamy mouthfeel and the taste was malted and nutty to start with a hint of cinnamon at the end. Chocolate Oak Aged Yeti (9.5% ABV) The oak really came through in this black stout. Weirdly it smelled like glass cleaner – but not enough to put us off or keep us from drinking it. Not a sweet imperial stout to begin with, this version of Yeti had a oak center, chocolate finish and bitter coffee tones throughout.